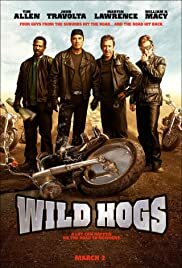 A group of suburban biker wannabes looking for adventure hit the open road, but get more than they bargained for when they encounter a New Mexico gang called the Del Fuegos. Your favorite film that features (a) motorcycle(s)? Favorite film featuring a Motorcycle and Sidecar Rig? In order to protect a beautiful woman and her son from a robber, a male FBI agent disguises himself as a large grandmother. A former convict poses as a cop to retrieve a diamond he stole years ago. Martin Lawrence plays Jamal, an employee in Medieval World amusement park. After sustaining a blow to the head, he awakens to find himself in 14th century England. Dudley Frank: [after getting a fist-tap from Woody and nearly wiping out] Whoa! Whoa! Oh! Man, oh, man. I almost lost it back there. I didn't know what was going on. maybe here and there a bit overplayed but it was sure funny! Four guys in their late forties - probably more early fifties ... ;-)  go through their midlife crisis. No matter if loving, nagging or no wife, life is just not what it used to be  or ever was. 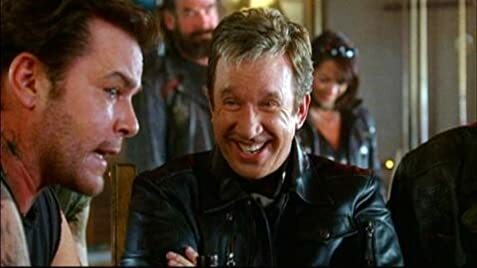 Adventures are searched for, and John Travolta (not acting his best in this movie) has the saving idea for his buddies: a real road trip on their bikes instead of their usual short trip to a biker bar once a week. Like in "City Slickers" the men have to go through some adventures and become heroes before they emerge with new energy to battle the next years of getting older ... however, the adventures these guys have on their trip are hilarious. The end slows down a bit with its predictability but this movie is very entertaining, funny and the ticket money well worth. 61 of 95 people found this review helpful. Was this review helpful to you?